What symptoms does your 90 dry eye treatment plan relieve? I wear contact lenses. Can I still use the 90 day dry eye treatment plan? Yes, however we advise you should remove your contact lenses before using the heat bag and cleansing. Then follow the instructions contained in the leaflets accompanying your products. My eyes feel itchy rather than dry; will the 90 day plan help me? Itchy eyes are often a sign of allergy as opposed to a dry eye, although both conditions can occur together too. We would advise you get more information from your or optometrist or GP to confirm your eyes are suffer from allergy as opposed to dry eye – there are several effective eye drops available for this condition including Pollenase available for you to buy on our site. Using a cold compress over the eyes and cool Thealoze applied from the fridge is also a very effective treatment for allergy, but if your itchy/allergy symptoms still persist then you may benefit form a specific anti-allergy eye drop as discussed above or consult your Optometrist or GP for advice. Can you explain what the eye heat mask does and how it works? The eye heat mask we recommend also known as the Eye Doctor® and is a Registered Class 1 Medical Device with the Medicines and Healthcare Regulatory Agency (MHRA). The eye heat mask is a soft heat bag designed specifically to be warmed in the microwave and placed on your closed eye and lids, stimulating the oil glands in the eyelids. This is the single most common cause of dry eye problems. Heat treatment is now recommended by eye specialists for Meibomian Gland Dysfunction (MGD), Blepharitis, Dry Eye Syndrome and even Styes. Your treatment pack will include The Eye Doctor® and a pouch for safe storage together with a comprehensive instruction booklet and how to use the mask, warm the mask, how place it over your eyes and how massage your eyelids to improve tear flow and tear quality. It is very safe, effective and feels very relaxing and comfortable and will immediately improve the look and feel of your eyes and will helps variety of dry eye related conditions. After using the Eye Doctor®, with your eyes closed, gently massage the upper eyelid by smoothing a finger from the inner corner of the eye to the outer corner just above the lashes. Repeat this procedure just below the lashes on the lower lid. Repeat this exercise for approximately a minute. This needs to be performed ideally twice a day for 2 weeks then once a day in the evening. Once symptoms improve 2 to 3 times a week should be sufficient. Fasten the head band to secure if preferred. Pressure can be adjusted to suit your personal comfort. You should not use the eye mask on broken or bleeding skin or if you are allergic to any natural grains. Ensure you remove all jewellery and your contact lenses before using and never share your eye heat mask – it’s for individual use only. What do other specialists have to say about the Eye Doctor? The heat mask we offer is recommended by eye specialists and ophthalmologists. “In my opinion The Eye Doctor is the best quality eye mask on the market. Not only do I love it for my eyes, but it appears to be my patient’s first choice microwavable hot compress. Personally as a Dry Eye Disease sufferer I love the high quality and comfort of the Eye Doctor. As someone treating Dry Eye Disease I am wowed by my patient’s feedback on the quality workmanship and how important it is for them to be able to wash their Eye Doctor eye mask – especially in the summer heat! Why do you mainly recommend preservative-free products for dry eye? Research has found that the preservative in many eye drops can actually make the problem of dry eye much worse. Preservative free-drops are now the best choice for the treatment of dry eye. This also makes the products we recommend in our 90 day plan safe to be used by all contact lens wearers too. We recommend a lens wearer puts a drop of Thealoze or Clinitas on to the lens before applying it to the eye and then add additional drops to the eye during the day if required. Using the drops after removal of the lens will certainly also help any corneal damage caused by lens over-wear to be reduced and heal/recover more quickly. Why do I need to use 2 different dry eye drops? We want you to achieve the best results based on our expertise and experience as both drops work in different ways. The Thealoze drops create a natural defence against dehydration of the cells of your cornea (and even reduce the material in your contact lens is made of from drying out) and improves your tear break up time. The active ingredient in Thealoze is naturally found in plants such as Cactii that have to live in very dry and arid areas where they must retain moisture to survive. Thealoze has also be found to improve the health of cells that are dehydrated and drying on the cornea and also is found to improve and repair rates and healing of scratches and abrasions. Clinitas is a preservative-free form of 0.4% Sodium Hyaluronate (also known as Hyaluronic acid). This is a natural product found in the body that thickens fluids, lubricates and plumps up many parts of the human body. Studies have shown hyaluronic acid increases the Tear Break Up Time (TBUT), decreases cornea and conjunctival staining and decreases pain in patients with dry eyes. The Sodium Hyaluronate we recommend is the highest strength commercially available preparation for dry eye relief and due to its visco-elastic, lubrication, hydration and healing properties, it is used in extensively in various dry eye clinics throughout the country including private and NHS hospitals and also in many corneal laser clinics to speed up corneal healing. Clinitas is also is available on prescription. Sodium Hylauronate is also used in the medical and cosmetic industries to prevent skin from drying out and remaining fresh and smooth. The formulation we recommend is more viscous than Thealoze and therefore is often better suited to be used 1st thing in the morning or last thing at night, but can also be used during the day if needed. Leave 30 mins between Thealoze and Clinitas for maximum effect of both drops. Clinitas comes in unique sterile vials that are re-sealable, so you can use the same vial for 12 hours. It makes them very convenient to carry and exceptionally good value for money too. “My eye specialist recommended Thealoze and I found it brilliant. I have suffered from Thyroid eye diseases and one of the symptoms is extremely dry eyes. I found the drops amazing“. “I got Instant relief with Clinitas Soothe and experienced overnight clearing of redness. My eyes are bright and white in the morning“. - Leslie Stephens We have found that using the two products together has a synergistic effect on your eyes meaning the sum of the two is greater than each product on its own! – we believe this happens as both have different ‘modes of action’ on the cornea and tears. You recommend stopping or reducing alcohol intake can you explain why? A study based in Korea in 2012 found that drinking alcohol encouraged body dehydration and increased tear film instability and therefore increases the risk of dry eye. The evidence found during this study suggests that the effects of even a small amount of alcohol can increase and exacerbate symptoms in dry eye patients. If you can reduce your alcohol intake, it will certainly help reduce your symptoms of dry eye. I have heard caffeine may help dry eyes is that true? There was a small study in Japan in 2012 that did find that taking caffeine tablets stimulated the central nervous system to produce more saliva as well as tears – and therefore improve dry eye symptoms. Caffeine however is also described as a diuretic, which means it can cause body dehydration and fluid loss in some people, so the ‘jury is still out’ about caffeine – it may well affect some people positively in the case of dry eye, whilst a few others negatively depending on their personal metabolism. I have a patient that swears to that his eyes feel less dry after having a cup of coffee in the afternoon after lunch compared to when he skips his coffee. Others have told me it makes no difference and just makes them go to the loo more! A recent study also found that the Nitric Oxide found in coffee could help your retina. We have not included caffeine in our 90 day plan – yet! But watch this space. It is something that individuals could try and experiment with themselves any feedback would be most helpful. I have heard Vitamin A may help dry eyes is that true? If a person is low in Vitamin A, studies have found increasing their vitamin A intake will increase the number of goblet cells on the surface of the cornea and therefore improve Mucin production (part of your tear film) by these cells. You recommend cessation of smoking can you explain why? Smokers have been found to have a ‘quadruple’ risk when it comes to dry eye – firstly your corneal sensitivity will be reduced as well as a reduced tear quality and quantity. Several studies corroborate the harmful effects of cigarette smoking, also revealing the directly irritative effects of cigarette smoke (and other smoke related pollution in the environment) that generally lead to defects in ocular surface defence as well as leaving your eyes looking more red, and feeling more sore. Reducing smoking and protecting your eyes from dust and smoke with wraparound sunglasses will reduce your dry eye symptoms in these cases. Why do you recommend reducing white bread and cereals in my diet? One of the main root causes of dry eye and tear film instability is raised ‘tear osmolarity ‘– this means that your tears become too concentrated. Tear evaporation is the main cause of this, however certain types of salts and sugars increase tear film instability – and this gets worse as your tears evaporate which is the case in the vast majority of dry eye sufferers. The drops we recommend during the day in our 90 Day Plan (Thealoze) are isotonic and therefore will reduce the concentration of your tears thereby reducing the ‘burning’ and ‘stinging’ sensation many dry eye sufferers feel. However your tear film osmolarity can also be reduced by changing your diet – cereals and white processed bread have very high levels of ‘hidden’ salt and sugar. If just these two items can be reduced or in your daily diet, you will find that your dry eye relief will come much more quickly. A balanced diet with 7 portions of fresh fruit and vegetables, oily fish and high in naturally protecting nutrients including vitamins A, C and E instead of processed carbs will improve your dry eye symptoms. A patient of mine now has a big bowl of left over stir-fry instead of a big bowl of cereal every morning and is already seeing the benefits of doing this on her dry eyes, but also on her blood sugar levels and on her general well being too. Both cataracts and dry eye are associated at much higher rates with people who have diabetes and high blood sugar in comparison to the general population so the right diet is essential in reducing your dry eye symptoms. Water is essential for the correct functioning of all our body cells and for chemical reactions and metabolism to work efficiently in the body. Water is particularly important for your eyes and for tear film balance and tear film stability. This was confirmed in recent studies in Japan and in the USA. If you wake up in the middle of the night and your eyes feel dry, try drinking two glasses of water on an empty stomach and you’ll quickly notice the positive power of drinking the right amount of water and remaining hydrated has on your dry eye symptoms. Up to half our body weight is due to fluids. We advise that you drink a glass of water as the first thing in the morning and have a second glass BEFORE you have your breakfast. Then take a further minimum of 5 glasses throughout the day, preferably 30 mins BEFORE food whenever possible. Mild dehydration is common and often makes dry eye problems worse. This is especially true during hot, dry and windy weather. Simply drinking more water sometimes reduces the symptoms of dry eye syndrome. The Institute of Medicine says that each day, women need 91 ounces of water and men need about 125 ounces to stay hydrated. Experts agree that about 20 percent of the water your body needs comes from the food you eat, while the rest originates from the fluids you drink. The best choices for beverages are pure water, followed by 100 percent fruit and vegetable juices. Why do you recommend Lagad Lacrima capsules? Are there any side effects? Largard Lacrima formulation was developed in France and based on the work of ophthalmologists and nutritionists who specialise in research of dry eye. It is an essential core part of the 90 day treatment plan to rebuild your tears. Lagard Lacrima comes in easy to swallow soft gel capsules and consists of antioxidants, vitamins, minerals and essential fatty acids (omega 3 and omega 6 but in the optimal ratio to improve your dry eye symptoms) to also improves the nutrition to your cornea and improves the quantity and quality of your tear film. Lacrima has a ‘triple action’ – an anti-inflammatory effect on your eyelids, and your cornea reducing cell death and damage as well as improving the quality and the production of your tears themselves. Many patients see a positive result within 2 weeks of taking Lagard Lacrima and often can take a break from the tablets every 1 month out of 3 – this approach has been found to maximise its effectiveness and minimise cost and how we recommend you take these capsules . Many patients have noticed an improvement in dry eye symptoms by using Lagard Lacrima alone (see comment below this section). Lagard Lacrima capsules are now prescribed in the majority of corneal laser clinics in France after laser eye surgery and have been found to reduce dry eye symptoms, night glare and improve healing times after surgery. Omega 3 has been found to have many positive effects on the eye, brain and body and is also is a natural blood thinner too, so we recommend you inform your GP that you have started taking them. The omega-3 fatty acids, EPA and DHA, in Largad Lacrima may in very rare circumstances prolong bleeding times in some people already taking anti-coagulant medications such as warfarin and aspirin on a regular basis. If you are taking an anti-coagulant, or if you are scheduled for any type of surgery, you should notify your doctor and pharmacist that you are taking omega-3 fatty acids as a precaution. What do others say about Lagard Lacrima capsules? - Martine Francois, 58 year old Librarian. - Anne GOSSIEAUX, 57 Years old. Why do you also recommend daily cleansing wipes? Blephaclean wipes are impregnated with an aqueous solution designed to both cleanse and soothe your eyelids. They are an ideal and very effective for daily eyelid hygiene. They are particularly easy and convenient to use because you do not need additional cosmetic pads or gauzes. Regular eye lid cleaning will help keep the glands in your eyelid open to secrete the essential oily/lipid part of your tears. In addition to its cleansing properties, Blephaclean also contains ingredients that moisturise and regenerate the outer layers of your skin and eyelids as well as regulate skin oil production. These preservative-free wipes will improve your eye lid cleanliness, help in the treatment of Blepharitis (inflammation, redness and dryness of your eyelids and lashes), Meibomium Gland Dysfunction (MGD, the build up of oils and debris on the lid surface and eye lashes) associated with most dry eyes that cause the gritty irritation and redness of your eyes. Being preservative-free they are also suitable for use for all contact lens wearers. Daily ocular hygiene that includes the care of your lid and lashes is one of the secrets of preventing the build up of the oils and crusted matter around the eyes that can affect your eyes themselves creating inflammation, soreness and tired looking eyes . By cleansing your eyelids every day, even if you are not experiencing symptoms, is the basis of long term healthy eyelids, lashes and therefore a more stable tear film. Consider this routine as part of your daily eye health routine, like having a daily shower or brushing your teeth. You will see and feel he difference within just a few days. Heat, massage and eyelid cleansing are 3 key sequential steps in your dry eye treatment plan. Can you explain your 30 day money back guarantee? The guarantee is very simple – better feeling eyes in 30 days or your money back! The feedback we have had from our 90 day plan in our practice from hundreds of patients is so positive and is the only reason why we are so confident to make this offer to you. If you genuinely don’t notice a difference on how your eyes feels after following our plan for just 30 days, simply return all the products within 40 days of the date of original receipt and we will refund your purchase price (ex P&P). You owe it for your eyes to take this next step and see and feel the difference. What if I am still suffering from symptoms after 90 days? Our treatment plan, if followed correctly and diligently, guarantees to improve your dry eye symptoms in at least 75% of individuals that suffer from mild, moderate and even in severe dry eyes cases. There is no ‘cure’ from dry eyes: patients need to first understand their situation and then seek to control and reduce symptoms and effectively treat and manage their condition. The 90 day plan establishes this. Once you have felt and experienced the positive results, it’s far easier to establish your own personal optimal routine going forward. In many cases your regime can be lessened and simplified as your dry eye condition will now be much better managed and in control. In certain rarer circumstances your dry eye treatment plan may need further minor modification(s) to make it more effective, such as the use of antibiotic ointment or the use of punctum plugs or more specialist treatment in the case of systemic conditions such as Sjogrens syndrome (a triad of dry eyes, dry mouth, and rheumatoid arthritis or lupus) or also conditions associated with certain systemic diseases such as rheumatoid arthritis or rosacea that cause severe dry eyes and other complications. These normally require specialist involvement in secondary care (hospital). We recommend if your symptoms have NOT been substantially reduced in 90 days, you come to see is for your free post plan consultation – simply give us a call to schedule yourself to come in to see us. The normal charge is £70 for a dry eye consultation – but in the case of a patient that has completed our 90 day plan, we will provide this assessment/review for free on request. We may make subtle changes to your treatment plan that are personal and specific for you, alternatively if needs be, we may arrange a referral to see an eye specialist in secondary care (hospital) to get the treatment most appropriate for you. For those that need to see us, we would also advise you to download and complete this detailed dry eye questionnaire to help us further. If you are unable to come to our practice we advise you still download and complete the detailed dry eye questionnaire and book an appointment to see your GP and take this form with you also, Having a thorough knowledge of your current dry eye treatment will assist you in partnering with your doctor or eye care provider to optimally treat your condition going forward. Why do you also have other products on your website that you recommend that are not included in your 90 day plan? Our website includes all the products that we regularly use in our practice and routinely recommend in our patients for specific conditions. These products are all safe to use and for mild, moderate and severe conditions and symptoms of dry eye.They are all effective at treating dry eye symptoms (or allergy in the case of Pollenase Eye Drops) and can be ordered individually online in the knowledge they are being supplied by a specialist dry eye practice. Whilst here are hundreds of other dry eye products and preparations, the ones available on our site are the ones we normally recommend and use day to day in practice. The most successful products in our experience that suit the majority of our patients are the ones we recommend in our 90 day plan. Why do you also recommend blinking exercises? Blinking is a crucial part of keeping the right amount of moisture on your eye surface. When done properly, blinking coats your eyes with a fresh layer of tears while also cleaning the surface, moisturising it and encouraging oxygen exchange too. It is an almost subconscious action that means it’s not always done correctly. Whether you regularly work at a computer, watch a movie, live or work in a dry environment or have a slow blink rate, this will increase your dry eye symptoms. Under normal circumstances, your blink rate is an average 4/5 seconds, about 15 times a minute. When using the computer or staring at any other bright screen your blinking rate decreases by up to 70%! Blinking exercises, if performed correctly and regularly , will enable you to develop a full, natural and effective blink that will improve vision, comfort and reduce your dry eye symptoms and can even improve your contact lens comfort and wearing times. The simple blink exercise described will begin to prove beneficial after doing them for several days and certainly over the next 30 days if carried out conscientiously as part of your 90 Day Treatment Plan. It’s likely that you may have been blinking incorrectly for a number of years so it does take a little time to resolve incomplete or ‘flick’ blinking, but doing the exercises correctly for 30 days will reprogramme your eyes and eyelids and create an instinctive self-sustaining positive ‘habit’ that will reduce your dry eye symptoms going forwards..
Blink break! Before you continue reading… have a full gentle blink, keeping your eyes closed for 3 second and repeat this ten times before reading again. I find it hard to use eye drops, what do you recommend in this situation? You can follow a modified version the 90 Day Treatment Plan, to include the eye mask followed by massage, eye lid cleansing and also Visualize Dry Eye Mist a product which is a liposomal spray that stabilises your tear lipid layer that can be sprayed over your eyelids up to 4 times per day. These products can be ordered separately online from our site. I am vegetarian, which dry eye drops can you recommend for me? As a vegetarian you can follow your own 90 Day Treatment Plan, but with a few modifications. I recommend you use a product called Eyesiccal whose 100% natural formulation was recently endorsed by the Vegetarian Society of Great Britain (instead of the Clinitas and Thealoze). You can still also use the heat mask and all these products can be ordered separately on line from our site. You could also buy Flax Seed oil capsules from any heath flood shop, although trials show they are NOT as effective as Lagad Lacrima capsules, studies have found them to also to have some positive effect on evaporative dry eye with regular use. I don’t have severe problems just occasional symptoms when driving and working on the computer screen, what do you advise me to do? If you have mild symptoms of occasional dryness occurring form VDU use – blinking exercises, water therapy, lifestyle changes and using eye drops such as either Thealoze or Clinitas separately can be applied as required. A range of other effective products are available from on this site. I have used eye drops in the past but without success, why should they work this time? The most common mistake made by those using artificial tear therapy is they wait for the symptoms to appear before using drops. It is much better to instil drops ‘little but often’ before your symptoms appear, thereby prohibiting or diminishing the cyclical effects of dryness, particularly if your dryness is related to your environment such as heavy computer use or those who work outdoors in windy areas. I have been told I have a dry eyes, but my eyes water all the time, so how can I possibly have dry eyes? This is a common situation, excess watering are your eyes compensating for the dryness and is a reflex response to dryness. If you experience this, your eyes are already dry and should have started your artificial tear drops earlier. If your eyes are watering, it is important to get artificial tears started to stabilize the natural tear film since your the reflex tears are washing out the normal three layer system and therefore making your problem worse. There is no single “best” drop. No drop can correctly imitate the complexity of the normal healthy tears. The best combination in our experience at our dry eye clinic is Thealoze and Clinitas, with Lagard Lacrima Capsules there are other products we also recommend but we start with these products as this combination will relieve your symptoms short term but will provide effective longer term solution in rebuilding your tears. Why are most of the drops you recommend preservative-free? Preservatives are found in many dry eye prepartions and other eye drops as they resist the drops from becoming infected by microbial’s. The preservative Benzalkonium chloride (BAK) receives significant attention as it has been shown to be toxic to corneal tissues with frequent dosing. With low frequency use it is considered safe. However, there are problems with dry eye sufferers using it. Anything more than just mild dry eye will compromise the cornea, making it more likely to be adversely affected by BAK. Also, the decreased tear volume diminishes the ability to properly dilute BAK once applied to the cornea. Many dry eye sufferers use eye medications for other conditions such as glaucoma. Most medications are preserved with BAK. Dry eye sufferers should avoid it as much as possible. If you must use a medication with BAK (for dry eye or any other eye condition), minimize the amount coming into contact with your eyes by ensuring that every other drop, where you have a choice, is preservative free. Any pain, redness, or foreign body feeling after instilling BAK preserved drops should be discussed with your eye specialist. The drops we recommend for dry eye are either supplied in preservative-free vials or in special bottles that ensure the drops stay sterile without preservatives and that no preservative enter your eye. Why do I have to do so many things to treat my dry eyes? It really isn’t that complicated! – the truth is there is no ‘silver bullet’ that solves dry eye problems and the best results have been found to come from a holistic approach and proactive appraoch of simple steps, making a commitment to treat and manage your problem. The synergistic actions of combining the dietary changes, lifestyle changes , exercises, heat treatment, drops and medication is what makes this plan so effective and powerful. When you also understand why you are doing each step it also becomes very logical and simple too! Research shows that dry eye is a ‘multifactorial’ condition this means a variety of different causes result in your dry eye and therefore the best solution also needs to be ‘multifactorial’ too. Some of the factors may also include working in a dry environment such as an office in front of a PC. Therefore to successfully treat the problem you have neutralise a number of key issues and even possibly some secondary ones too such as ensuring your environment has more humidity (eg. by placing dishes of water near a radiator or PC or using plants or a humidifier to ensure your environment remains humid). Although this step is not part of the plan it is also useful to consider if you work in a severely dry office environment and regularly staring at your computer. 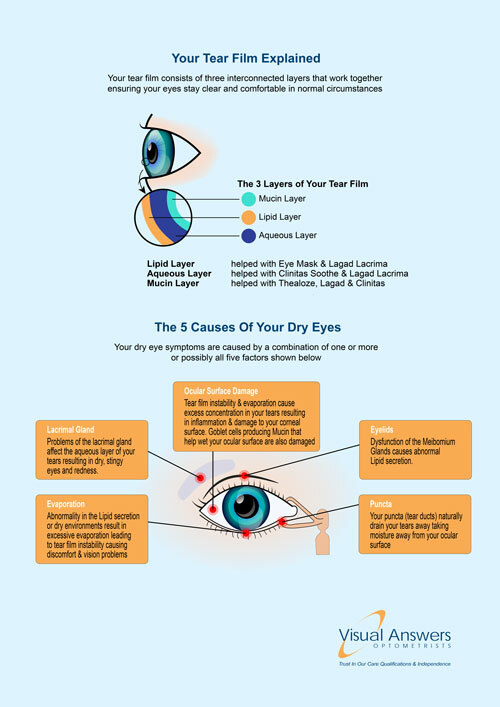 As far as your eyes are concerned, there are 3 distinct layers in your tears film and each layer is produced by a different part of your eyes and all the layers work together to produce your tear film. All 3 layers but provide different but essential functions. (See our visual at the top of this page for more information). Your corneal cells produce the innermost tear layer called the mucous or mucin layer of your tears (this layer helps the tears remain ‘wet’ and stable), the lacrimal gland found above the eye within the eyelid tissue) produces the aqueous or watery layer (your middle tear layer) and this is the bulk of your tears and the Meibomium glands on your eyelid margin produce the oily/lipid layer (the most outer layer) of your tears. Invariably more than one layer is affected in dry eye and therefore a number of or combination of different approaches are required to successfully treat and manage your condition and provide long lasting relief. Our 90 Day Dry Eye Plan does exactly this and why it’s so successful. The combination of increasing systemic hydration, use of preservative-free artificial tears and lubrication, improving tear quantity and quality with omega 3 based nutritional supplements, lid cleansing, heat treatment and massage, controlling lifestyle factors, eyelid exercises and proactively controlling potential allergic reactions and reducing risks of dehydration (by controlling alcohol intake and smoking) and the subtle dietary changes described will all help to achieve your dry eye relief. It is my goal that you find the relief you seek, as quickly and effectively as possible. The attached PDF will help you remember what you need to do on the 90 Day Treatment Plan. My eyes do not feel dry but very often go red and I currently use drops that make the eye look whiter, can you advise what I should do? There are certain products available that simply mask the symptoms of a red eye, by constricting your blood vessels on the white of your eyes for a few hours. They simply mask the root cause of your red eye (be it irritation, allergy, infection or inflammation, dryness or another cause) and often result in a rebound reaction where the eye looks redder. We would not advocate the use of such drops and they will not be found on this site. If you do have persistent redness in the eyes with no other symptoms a cool compress placed over a closed eye for 60 seconds is often very effective and soothing. If the redness persists you should see your GP or your optometrist. From time to time one of my eyes goes red and the other is fine – what should I do? When only one eye goes red, it would normally suggest you do NOT have a dry eye and we would advocate you urgently see your GP or optometrist for an examination and advice. If I need further advice can I contact you? You can contact us on info@visualanswers.co.uk, you can book a personal assessment with myself or one of my team of optometrists at our practice in Quorn and Barrow upon Soar, you can also call us on 01509 414151 in office hours and speak to one of my team directly any time during office hours too. Our normal charge for a dry eye assessment is £70 however anyone who books after trying the 90 Day Treatment Plan will have this at no charge. All the treatments provided have information leaflets that must be read to understand their proper uses. We advise your GP should be consulted before making any changes in diet or beginning any supplements. The author of these FAQ’s and this website is Mohammed Bhojani BSc (Hons) MCOptom a GOC registered optometrist who has treated thousands of dry eye patients at his practice and at the corneal laser centre at the Spire Hospital in Leicester. The content of this website and replies the questions are for general guidance and informational purposes only. All products and treatment plans are recommended with the express understanding that no personal medical advice has been given to any individual. Nothing replaces an examination by us or your eye care professional. Results from our 90 Day Plan are exceptionally positive but results vary from person to person based on the severity of their condition, how well and fully they adapt to the routine advocated, their own metabolism and other factor such as current medication. This website is intended to acts as resource to guide you as how to best treat your dry eye, Blepharitis Meibomium Gland Dysfunction, ideally in conjunction with professional personalised care and advice. Its intention is to educate you regarding and the multifactorial nature of dry eye syndrome and introduce you to some of the safest and effective combined strategies and treatments for mild to moderate dry eye and related conditions but no other eye conditions. Inclusion of any products in no way implies or represents an endorsement of any particular manufacturer and may change from time to time depending on our research and results. The treatments and products provided all have information leaflets that should be read to understand their proper use before application. Our blog is updated regularly with all the latest tips & advice. Use our free online assessment tool and find out if you suffer with dry eyes. We will then recommend you the best treatments to use. Enter your details to start the process of re-building your tears. To receive news and offers from Dry Eyes Treatment simply enter your email address below.